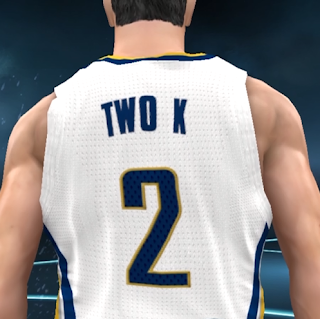 When I play NBA 2K12, I always have two keys to the game. The first is to get the best shot possible and therefore shoot a higher percentage than my opponent. The second is to keep my turnovers down. So in this tutorial, I am going to talk about how to reduce your turnovers by eliminating some of the more common mistakes I make and that I see when I play other people. If you have played online at all, then you know that it's a free-for-all with full court pressing and mashing the steal button constantly throughout the game. In this year's game, you'll see your share of Oklahoma City Thunder and Miami Heat users that defend you all over the court. These tips will help you deal with that constant pressure. While I don't know that these are all "technically" turnovers that show up in the box score as a turnover I see them as turnovers because the ball goes to the other team. So with that said, here are the top 25 turnovers I see and how I deal with them. In most games, I have eliminated a lot of these and it has vastly improved my game. Just like great shot selection, not turning the ball over does require some focus. I know some games, I lose my focus and turn it over a lot just like some games I don't shoot as well as I like. It really also depends on the quality of the defender you are playing. For the most part, my turnovers on average have gone down overall. I started with turnovers in the backcourt and moved into the ones that happen in the front court. You will also notice that in several cases I recommend calling timeout to avoid the turnover. I guess it's possible you might run out of timeouts, but running out of timeouts has been pretty rare and honestly, I don't really remember running out of timeouts. A well timed timeout is good basketball strategy. I try and keep at least two timeouts for the end of the game. Below these tips is a video of a game where I turn it over a lot. While it's not usually a problem to at least hit the pass button, sometimes your players won't react. As you try and figure out how to get the ball in bounds, you run out of time and turn the ball over. I think this usually happens because a player down court has been selected. The game seems to have a safeguard to prevent you from just blasting it all the way down court. This safeguard makes it appear that you can't pass it in. How to avoid turning it over: To avoid this, on the PS3, hit the R1 button and press the icon of the player you want to throw it into, then press the pass button. If that doesn't work, then call time out. Online, there's almost always a guy waiting ready to pick off the inbound pass. Sometimes it seems like there are three or four guys waiting. If you have an opponent who likes to press the full length of the court, then there are just more chances you will turn the ball over. If you turn the ball over here, the other team can get an easy dunk on you which can turn the momentum of the game in their favor. How to avoid turning it over: Before you pass the ball in, look at the defense and see where the defenders are. Sometimes, it's just token pressure to see if you they can get a quick steal and if you wait a second they fall back. What I recommend here is to move the player who is supposed to receive the pass so that he is open in front of or to the side of the defender. The best possible way to do this is to move him right in front of your player that is inbounding the ball. This shortens the passing lane and makes it easier to get the ball inbounds. I've noticed a lot of times that I get the ball stolen from me right after I get the rebound. This can happen before you even realize that you have gotten the rebound which can be pretty frustrating because you didn't really have a chance to do anything. Before you know it, it's another dunk in your face or a quick shot and then the defense is right in your face again. Fortunately it doesn't happen all the time unless your opponent is constantly hitting the steal button. If so, then read on. How to avoid turning it over: Make sure that you secure the rebound before you try and move your player. If it's a center or power forward and you want to make sure that there's no chance that he will lose the ball after getting the rebound, then on the PS3, hit the triangle button to protect the ball. It causes your player to pick the ball up and then it can be protected better than if you were standing there dribbling it. Sometimes, your guards will stupidly go up court leaving your center or power forward standing there. In this case, the best thing that you can do is advance the ball unless you get challenged then call a timeout so you don't get the ball stolen. One of the great things about NBA 2K12 is that it is such a fast paced, exciting game. So what happens is that as soon as we get possession of the ball, we immediately hit the pass button to get the ball moving up court. The only problem is that a lot of people I play online are ready for that pass and pick it off. They seem to know exactly where to position their defender to get the easy steal. Then they get an easy basket. How to avoid turning it over: Take your time. Once you get the rebound, find your point guard and wait for him to get open. Often you will need to move the player with the ball up court a bit to create that opening. Just be careful if you take your big men up court. They are easy to steal from so you might want to call time out if they get near a good defender. Once you start to move the ball up court, you will encounter defensive pressure that will try and bump you and steal the ball. Sometimes you even get double teamed. If your dribbling player is a big man, it's compounded by the fact that he is a poor ball handler, there's a huge chance the ball is going to get stolen. But even if he is your point guard, driving into the defender can cause you to lose the ball resulting in a fast break score for your opponent. How to avoid turning it over: The first thing you want to do here is make sure that your big men aren't bringing the ball up court. Get the ball to your point guard and if that's not possible, get it to your shooting guard. If your big man has the ball and you can't get it to your point guard with defensive pressure coming, then call time out. If your point guard has it and the defense is extended move the ball with the left stick to dribble with the hand away from the defender. While it won't guarantee it won't get stolen, you will draw a lot more fouls that way when the defense starts reaching. If you find your player getting stuck in some sort of animation, pull back on the stick. Call time out if that doesn't do any good. To avoid double teams, try and stay near the center of the court and away from the deep corners. Usually if the double team comes there's an open man somewhere, look around for him and see if it's possible to make a safe skip pass to him. If not, pass to the nearest teammate instead. I prefer to dribble away from a double team and make the pass before I have to pick up my dribble. Again you can call time out if you are smothered in defense. Chances are that if you have a guy guarding you all over the court, you are going to also see his guy trying to take the charge every where as well. I see this mostly in the back court as I am bringing the ball up the court. But of course, it can happen everywhere on the floor so be alert for it. The defenders will try and get position to draw the charge. While it's annoying, you still have to deal with it. How to avoid turning it over: For the most part, if you avoid the defender and not turbo into them, you'll avoid the charges. Once you have seen it a few times, you will learn how to avoid it. It still happens from time to time with me, but it's few and far between. If a team is pressing you full court, it's primary objective is to either get a quick turnover, use up shot clock or just get you to rush your offense and take a bad shot. In the process of exerting all of this pressure, you'll sometimes be so focused on the defense, you will forget to get the ball over the center court line before eight seconds has expired and you will turn the ball over. How to avoid turning it over: Watch the shot clock. If you see it getting close to 16 seconds, call time out. Also keep in mind that the defense is counting on you to use turbo or force a pass down court to get it across the line in time. If you use turbo, this makes you more vulnerable to the steal so don't do it near a defender (who you'll see reaching wildly). If you call time out, you have a fresh eight seconds to work with. I don't think it works this way in the real NBA (I'm not sure) so count yourself lucky. Pushing the ball up court can result in easy baskets - if they are well timed and well placed. The first fast break turnover is when you throw it to the guy running up the court to get in the corner and when he catches it he runs out of bounds. Another is when you throw it to a guy that has bad hands and he bobbles it and loses it. The other one is when you pass it to a guy on the break and he moves from where you thought he would be towards the basket and right into the hands of the defender. How to avoid turning it over: These turnovers can be frustrating. My first advice is don't make those passes. Take your time. Learn from experience whether the guy you pass it to is going to stay still or move or have time to catch it and stay in bounds. It seems only natural that when you are bringing the ball up the court with your point guard that you should be able to sprint pass slower defenders like Pau Gasol of the Lakers and Joakim Noah of the Bulls. And it seems natural to think that if you are Darren Collison you could outrun a defender five feet behind you. But in the game it doesn't work that way. If you use turbo to get past a defender bringing the ball up court, you can almost count on them knocking it out of your hands. How to avoid turning it over: Don't turbo bringing the ball up unless you have a clean path around you. Dribble the ball with the hand away from the defender and don't turbo. Unless the defender cuts off your path, you should be able to bring the ball up. If you stay towards the center of the court that will help as well. This keeps the sideline from being another defender. Another turnover that I sometimes get is the backcourt violation. Not because I went over the line and back on my own, but because I got stuck in some sort of animation or was pinned to the half court line by the defense. It's better this year in that most often, the defense is called for a blocking foul if they run into you at the line and cause the violation (a change I like by the way), it can still happen. How to avoid turning it over: Keep the ball handler away from the defenders near the half court line and don't cause collisions with them there. Also watch for the double team. I've surprised people at the line with a double team and gotten them to step on the line. No matter what you do, you are going to have times where a great defender steals the ball from you. Chris Paul, Ronnie Brewer and Rajon Rondo have some of the highest steal ratings in the game. There are times that they will just get a steal if you are near them. I'm not saying that it's necessarily right that the game is that way, but that's the way it works. How to avoid turning it over: The main things you can do are to avoid coming near defenders with high steal ratings with dribblers that have low ball handling and ball security ratings. Don't run the offense with your big men. If the defender is so much better than your point guard, use your shooting guard. But honestly, if you keep your turnovers to just this category, you won't have many a game, probably less than 3 to 5. Sometime you will make a pass to a guy who will immediately run out of bounds. How to avoid the turnover: Make passes to players that are set or on there way to certain spots. If you are on the move, your teammates will be too and sometimes that movement if you get the ball to them at the wrong time will carry them out of bounds. Make note of when you see it happen and avoid that pass. I've noticed that sometimes I will get the rebound and my guy will just fly out of bounds. Or, I will dribble towards the baseline and just go right on out. How to avoid turning it over: Use extra care near the baseline to not run into a defender and get forced out of bounds or to push your stick in the wrong direction. In real life basketball, coaches always teach you to never make cross court passes. I'm always amazed that even at the highest level of NBA basketball, I still see cross court passes and even in very crucial game situations it happens. In NBA 2k, some of my turnovers come in this area. The difference is that when I think of a cross court pass, I think of a pass going all the way from sideline to sideline. In the game though, just going from one side of the court to the other is a cross court pass and the majority of the times, it is easily picked off. It doesn't mean you can't get away with it, you can from time to time. How to avoid turning it over: In 2k camera view, draw a line down the center of the court. Don't throw it over that line unless you have a wide open passing lane. It's better to make passes on the same side of the court. This is a tough rule to follow for me, but it's a good one that you should definitely avoid throwing over that imaginary line. This is a big one for me. I want to get the ball to a player so I pass it. The only thing is that the player wasn't open. Then the pass gets intercepted. How to avoid turning it over: Make sure your teammate is open before you pass it. If there is a defender between you and the man you are passing to, that's a good sign you shouldn't pass it. Notice in the previous picture with George trying to get it to West. There is a defender right there and I threw it anyway. You can't do that. This is an area where I could improve. I make heavy use of icons to pass to my teammates. I often leave them up and take them down when I am ready to shoot. A lot of times, I want to throw it to Paul George and throw it to Danny Granger instead because I hit the wrong button on accident. Since I am not a little kid, I am not as good using the controls as a kid might be and just make mistakes. I also sometimes decide to shoot with my icons still up and forget to take them down first. Because of that I might pass it by mistake (when I meant to shoot) resulting in a turnover. If you don't use the icons to pass, you can also throw it to the wrong guy because the pass button doesn't see where you want to throw it to. Often it's the wrong guy. How to avoid turning it over: You can tell who the pass will go to if you use the pass button by looking at the darker gray circle under the intended player who will get the ball. I'm an icon passer because it's hard to recognize who has the gray circle. I tend to think of my players as their icon as well. Collison is X. George is O and so on. The first thing I do is make sure that if I sub I do it manually and that I am consistent about the position a player plays. And if I see that guy, he isn't square one game and triangle the next. One other thing I do is just be extra patient. This is another area where I need work. This isn't usually a big one for me since I rarely alley oop it at this point, but I do see people online alley ooping the pass to players who aren't there or forcing it. The ball goes sailing to nobody and many times I can just catch it. How to avoid turning it over: Be sure and practice your alley oop hot spots where it's a sure thing. I sometimes get called for travelling when I fake it after doing a turnaround post move with Roy Hibbert. That's about the only time I have seen it but it happens to me when I am posting sometimes at crucial times. How to avoid turning it over: Spend time in practice mode perfecting your post moves and try not to string to many moves together. You can't stand in the painted lane area below the free throw line for more than three seconds. If you do, you get a three second call. How to avoid turning it over: This one is fairly easy enough to avoid. Just don't camp in the lane. This is another one of those turnovers where one of your CPU teammates can get called for even if you aren't controlling them. It will happen when your teammates are expecting you to take a shot but instead you dribble around some more. The pick and roll is one of the best plays in basketball. But if you don't run it correctly, you will turn the ball over. If the screener doesn't get set before he sets the screen and is moving when the ball handler runs his man into the screen, you are likely to get called for a foul and then turn the ball over. How to avoid turning it over: To avoid getting called for an illegal moving screen, make sure the screener is set. He will kind of stiffen up when he is. A more uncommon turnover is backing your man down into the paint for more than five seconds. If you press triangle and move into post position and then start dribbling and backing your man down into the lane, you can't do that longer than five seconds. This rule was put in place because Mark Jackson of the Pacers use to back his guy down until he scored. They didn't want the small market team getting any advantage so they limited that time. How to avoid turning it over: Shoot with five seconds or pick up the ball. You can also hit triangle button again to get out of posting position. This will stop five second count. You are more likely to turn the ball over at the beginning of a move. For example, at the beginning of a turbo move, if the defense times it right, they can cause a turnover. It works the same if you start and isomotion, layup or just move the ball in front of the defender. A well timed steal attempt will knock the ball loose. How to avoid turning it over: Be aware of the defense and adjust your moves accordingly. Realize that you can't isomotion with players who don't have the skills and create space between you and the defender before you start the move. Know your players strengths and weaknesses as well as those of the player guarding you. Once the shot goes up in the air, you want to get good rebounding position. To get the rebound, you have to hit triangle to jump. If you are being blocked out and hit the triangle button, you could get called for going over the back. How to avoid turning it over: In the picture to the right, I wasn't even controlling Collison and he committed the foul. So, it can happen even if you aren't controlling the guy. But what you will want to make sure of is that you don't hit the triangle button when you are being blocked out. Instead get good rebounding position then jump. Each possession you have 24 seconds to get a shot off. If you don't, it's a shot clock violation. Most players online probably don't know there is a shot clock they shoot so quickly. But if you take your time, the defense can cause you to run out of time. How to avoid turning it over: If you see the shot clock get down to about 10 seconds, it's time to start getting in gear to get a shot. You'll notice that the shot clock starts beeping at 5 seconds to give you additional warning as to when the shot clock will expire. Personally, I'd rather the shot clock expire if I don't get a good shot. The reason? A bad shot that misses often leads to a fast break score for the other team. A shot clock violation means they take it out of bounds and have to bring it up against your defense which is already in position. This isn't really a turnover, but if the defense gets you to rush your possession and take a quick shot - or a bad shot - then they have succeeded. Many times, they can take that miss and turn it into a fast break. How to avoid turning it over: Do everything you can to get the ball down court quickly and safely and get a GOOD shot. The key to reducing your turnovers in NBA 2K12 is to first of all start looking at how many turnovers you actually commit in a game. When I first started playing, I would turn it over 10 to 15 times a game easy. Once I knew roughly how many turnovers I was committing, I could then focus on specifically where I was turning the ball over and work to correct and improve it and set a target turnover goal. My first objective was to get it under ten a game. I do pretty good at that for the most part but I still have problem areas and games where I do poorly. My goal now is to get it under 5 a game on average and to get my first zero turnover game. 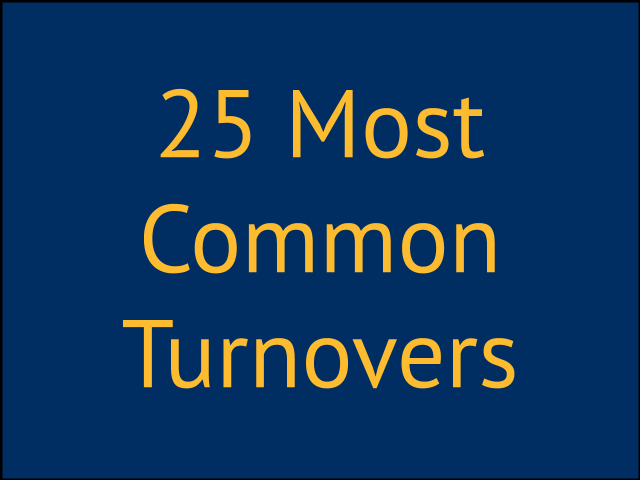 The turnovers in this list that I have the most trouble also include areas that I can control. I also know that I can improve on avoiding throwing the ball cross court, forcing the pass and just throwing it to the wrong guy by accident. Now that I've identified the areas I need to work on, I can begin to focus my efforts in these additional areas specifically to reach my goal. There you have it. My twenty five most common turnovers in NBA 2K12 and how to avoid them. If you follow the advice above, you will reduce your turnovers, shoot better than the other team and win more games online and offline. How do I know, because I have done it and I know it works. But just for fun, there's a video at the top where I turn it over a lot and talk about the 25 turnovers. Today I wanted to talk about how to get better at shooting in NBA 2K12. Once you learn the concept of how to improve your free throw shooting in NBA 2K12, the next logical step is to work on your jump shot and shooting from the field. Just like a player's free throws, each player also has a specific shot release that you will have to master. If you follow this ten step guide, there is no doubt in my mind you will improve your shooting percentage from the field. Improve your team's field goal percentage and you will win more games. It's that simple. While I wrote this guide with the PS3 as my platform, for the Xbox the fundamentals below are the same. Just check your game manual for the proper game controls that you should use. You may not go into the detail I do in my guide, but then again as your Coach, I'm going to do everything I can to give you the edge you need to shoot the lights out. [catalyst_hook_box name="googleinpost"]The first thing thing you will want to do is take your team into freestyle practice mode. Once in the practice mode, you will want to go into the game play settings and turn it on Hall of Fame mode. The reason I recommend shooting on Hall of Fame mode in practice is because it's the hardest mode to get a perfect release on. If you can do it on Hall of Fame mode setting, you will find it much easier to shoot on the lower levels of Rookie, Pro, Allstar and Superstar. I also suggest that you use the default speed setting of 55. I am assuming that this is the same speed that is used online. It's a good idea to use the same speed settings across all modes so that your timing is the same throughout every game mode for everyone's release on your team. I also set my camera view to 2k, the view I use in the games I play. You don't want to practice in one view and play games in another camera view. The timing and feel will be different if you do. Once you have done that, you will want to go to the menu again and choose presentation. Inside there, turn on shot timing feedback and adjust shot quality feedback to "all shots". In addition to the shot indicator and shot quality feedback, one other thing you may not notice at first is that when you shoot, the circle under the player you are shooting with will flash blue when you should release the shot. The blue circle that flashes under your player does so automatically. You don't have to turn that indicator on in the settings. With these settings turned on and the circle under your player flashing blue at the proper time, you will be set to master each player on your teams shot release. On the PS3, there are two ways to shoot the basic jumpshot. The first way is to hit the square and release. The second way is to use the right stick. I usually pull and let it go for the release. The question is should you use the square to shoot with or the right stick? While "The Kid" uses the square button sometimes and the right stick others, as your Coach, I strongly recommend using the right stick for all shots. I suggest using the stick for all of your shots. Your layups, your dunks and your jump shots. If you use the stick for all of them, then when it's time to shoot a layup with your hand opposite the defender, you won't have to switch to the stick. You'll already be in "stick" mode on all shots. I also think that when I let go of the stick to release my jump shot that it feels more like a shot in real life. But that's just me. To dunk, you will want to hold the R2 button and push the right stick forward. Pushing the stick in the other directions to dunk will change the type of dunk your player does. For example, to do a reverse dunk for some players, you would hold R2 and pull the right stick toward you. A player's dunk package determines what kind of dunk he does. I noticed that Roy Hibbert doesn't do a reverse dunk. To shoot a layup, move the right stick to the hand you want to shoot with. Keep an eye on the defense and shoot with the hand away from the defense. Late - The indicator will show at the front of the players head and be in red. You can also tell whether you released the shot early, perfect or late by without a shot indicator by watching the result of your shot. If you release it early, it will be long, perfect and it will probably go in and late it will come up short. This is handy if you are playing online where there is no shot indicator. You can tell by looking at what your shot does by how you timed it. The other thing that is important to note is that just because you release it in the green zone, doesn't mean that you will hit it every time. It's just more likely. Also, think of each release zone having a broader window of time rather than an exact early, an exact perfect or an exact late. This means that the shot indicator could be green and the release not be exactly perfect but still go in. It will also depend on the player you use, their ratings and hot zones from where you are shooting from. In games it will also depend on the defense and situation at the time. The next step then, is to practice shooing with each player on your team. In practice mode, you can substitute each player into practice mode to work on your timing. Your goal should be to learn to be able to get a perfect release with each player. You'll notice that each player on your team will have a different type of shot and because of this they will also have a different time you need to release the shot. This makes the game fun and challenging. Mastering each player's proper release point might seem hard to do at first, but with practice, you can do it and once you learn how to do it, if you decide to play with another team in the league, it won't take you nearly as long to figure out. Here are some extra tips to master your shot releases. Experiment with the release to learn when you need to let go to get green every time you shoot. Watch for the circle to flash to learn when you should release. Watch each player's shooting hand and try and release when it starts to move forward. Watch for other "tells" a player might show that indicates the right time to release. For example, Dirk Nowitzki kicks his legs out when you should release. Take lots of shots in practice mode. Start with one player, work on mastering their shot release until it becomes second nature. Then, work on the next guy on your team. If you do those things, you will definitely improve your shot releases. Start with one player, master their shot release, and then work on another. Before you know it, you will have mastered everyone on your team. Keep in mind that you can release a shot perfectly and it won't go in every single time. It doesn't in real life and it won't in the game either. There are fourteen zones on the hot zone chart. The outer ring is the three point ring, the ring just inside of that is the midrange zone, the ring just inside of that is the close zone and finally, the ring inside the take charge circle is the inside zone. You'll notice that the hot zones are color coded. Red for hot, gray for neutral and blue for cold. From my experience, what it means is that in a red zone, maybe in practice you would hit 7 or more from that zone out of ten. A neutral zone, maybe 6 or more and blue 5 or more. Any given time, you might hit more or less just like a real shooting practice would be. It's not an exact science. You can hit shots from all zones. You can miss shots from all zones. From the same spot, you will probably hit more shots if the zone is red than grey and more from grey than from the blue. Knowing your players hot zones is only part of the equation. The second part is how well your player shoots within each ring. You can find this by going into the substitution menu and looking at a players ratings. Each player has ratings for inside, close, medium range and three point shots. The higher the rating the better the shooter. If you get to know your team and know for example, that one player is a good shooter from medium range and you are set and open with that player, get a perfect release and it's in a hotzone, you will have a better chance it will go in. If you hit a high percentage of your shots, there is a pretty good chance you will win the game. To do that, you have to learn to take good shots. The first step in doing that is by paying attention to the shot quality grade in the upper left corner of the screen when you take a shot. Each shot is graded from a high of "A+" to a low of "F". The more A+'s you get, the more likely you are to score. Again, and this is important to note, it doesn't mean you will make every shot. It just means that you have a greater chance it will go in. You get A+'s by taking good wide open set shots in the areas your player shoots well from. You get lower grades by taking shots with a hand in your face or outside your players range or by poorly releasing the ball during the shot. What is a good shot? When I play the game, I do the best I can to take good shots. I don't always succeed but for the most part I do a pretty good job. It depends on my mood and focus at that particular time as well as how good of a defender my opponent is. Because I think the game for the most part is just a matter of shooting a higher field goal percentage than my opponent, my goal is to shoot as high a percentage as possible and keep my turnovers down. I will definitely be in the game if I do that that's for sure. I consider a good shot to meet the following criteria. You are within the three closest circles of the hot zones (and mostly the first two). Those are the "inside" zone, the "close" zone and the "medium" zone. I do everything I can to get shots in that range. A dunk is ideal. You wait until all five of your guys are down court with you. There are more rebounders that way as well. Unless you have numbers on the fast break, pull it out set it up. You work the ball around and don't take the first available shot. You can always pretty much get a three. A few passes and you might get a dunk instead. Your feet are set. You aren't leaning, running or fading away. You are open and the shot is not being challenged. You use a shot fake if you are in range of a defender (most important in the inside zone) to get the defender off his feet and move to get a better wide open set shot. You get a perfect release. You shoot in a hot zone for your player. You shoot in a zone that your player is highly rated for. This doesn't mean that you shouldn't take threes. But take open ones where your feet are set with the right players in their favorite spots. The guidelines above will definitely improve your shooting percentage. Plus, there's an added benefit that if you shoot from inside a lot, you will also get fouled. This will result in going to the line more often and ultimately getting a few and one's during the course of a game. I have even fouled out Lebron online before because it. That's an extreme case, but stuff like that does happen. What is a bad shot? A bad shot is basically the opposite of the above. A bad shot has the following characteristics. You are shooting all of your shots from the outside two zones. You force the fast break when you don't have an advantage. There are attacking more defenders, going one on three for example. You take quick shots before all of your players are down the court with you. Your feet are not set. You are leaning, running or fading away. You have defense in your face. You don't get a good release. You shoot with the wrong players in the wrong spots in the wrong zones. Can you still hit bad shots? Of course you can. It just means you will shoot a lower percentage than you could have over the course of a game and it will make it harder for you to win the game. Good shooters (shooters with stars and the 3 icons next to their feet) can often hit shots that other players wouldn't normally hit. But even then, it's best to get good shots with them as well. Give yourself the best chance to hit the shot and those guys will be unstoppable. Shoot ten shots from each zone working your way around the gym. Try your best to get a green shot stick timing indicator and A+ grade on each shot. Spend more time taking shots your player would take in the game. So don't worry about taking shots with your centers from three point range unless that's one of their specialties. Record your practice results to find your best hot spots. Your timing might be better in one zone over another. Spend extra time practicing threes with your three point specialists and more time shooting midrange shots with your midrange specialists. Before I play each day, I would take a few shots in practice mode with some of my key players in some of their favorite spots that I know I will use during the games. Chart your shots made and shots attempted from each zone. Here is the list of zones. The final step to improving your overall shooting percentage in NBA 2K12 is to see how you shoot in actual games and compare that to your practice sessions. At the end of each game, a shot chart is available for each player. It tells you what zone they shot in and the number they made or missed. This is your best tool because it tells you where your shots come from when you have to face an actual defense and will tell you where you need to practice. Knowing where you tend to shoot in the games will help you improve your practice routine. Are you getting good shots inside the first three zones? Are the bulk of your shots coming from your best shooters in those zones? Are you shooting most of your shots outside the inner three circles? Are you shooting from a players zones who are cold? Could you shoot with different players who might shoot better that have higher ratings? Although I think it goes without saying, the number one thing you can do to improve your overall shooting is shoot with the guys on your team that are the best shooters. If you can't shoot with them, make sure you are not shooting with the guy who is the worst percentage shooter on your team. Here's the spreadsheet I've started for my Indiana Pacers. There is one other thing that affects your shooting in NBA 2K12. That is the momentum of the game. If the other team is flying high getting fast breaks, dunks and three's you will find that it will be harder to make shots. This is more so when you are on the road and the crowd is going crazy. During these times of the games, you will want to buckle down and get a good shot within the first two zones - inside and close - preferably a dunk. Otherwise, even perfect shot releases may not go down if momentum is not on your side. Conversely, if you are on a roll, have been finishing fast breaks and dunking the ball, if you get an open three you are more likely to sink it if you using the right shooters and are open. If you hit a few shots in a row, you may also see a red fire symbol next to your player. Sometimes people think that this gives you the green light to shoot from anywhere and you will hit the shot. It just means you will be a little more likely to hit your next shot. Keep taking good shots and don't take shots you wouldn't normally take. Getting to the free throw line also warms your guy up and can trigger the fire symbol. If you miss a few shots in a row, instead of a red fire symbol, you will see a blue ice symbol. When you see this, it's probably more likely you will miss. I also would watch shooting jump shots when your player is tired. You will know he is tired when you see the "G" Gatorade symbol. Call time out to get some rest. I have also noticed is that some shooters don't shoot well every game. They can have an off game. It could be the defender they are up against. Whatever the reason, be prepared to give a "heat check" to other players on your team when you find one struggling. They often pick up the slack and if you find someone that is getting the job done, keep working it until your opponent stops it. If you follow ten step guide NBA 2K12 shooting tips, you will be well on your way to shooting a higher percentage and winning more games. Good luck! If you like this guide and it helped you, do me a favor and share it on the internet where ever you can. In real life basketball, many games are decided by just a few points. It's often the case that if a team had shot better from the line, they would have won. Depending on your style of play in NBA 2K12, free throws can often be just as important. I know when I first started playing NBA 2K basketball, the first few games I had a chance to win I lost because I couldn't ice the game. This was because I didn't know my players free throw releases. Once I lost, I knew I had to do one thing - learn how to practice my free throws in NBA 2K12. [catalyst_hook_box name="googleinpost"]So after I decided to make the Indiana Pacers the team I wanted to master, I knew one of the first things I would need to do besides master their shot releases was to master their free throw shot releases. The best way to do that is to go into free throw practice mode and start shooting free throws with all the players on your roster. Once you are in there, it's a good idea to have a game plan in mind to get the most out of your practice session. The first thing that you need to know once you get into the gym to practice your free throws is that you will be at the line already with an info box underneath you that has the player's information that you are shooting with. Next to that, you will find four release points. Those are too early, slightly early, perfect and late. To the right, you will see your free throws made, free throws attempted and your percentage of made free throws. These tools help you keep track of your progress. Each player on your team will have a different release. You'll need to learn the timing of when to release the shot for each player. What you will want to do is take a few shots. As you take these shots, the game will tell you whether you were early, perfect or late. Pay close attention to this feedback and adjust your release accordingly. Some players have releases that are easy to master because their "window" of perfect release is big. With some players, they have smaller windows of perfect release and it's harder to nail it. It will take some practice to get their releases perfectly. Here are a couple of tips to help you. While I don't use it, you will notice that the circle under your player will flash blue right at the point of the perfect release. I tend to watch their hands. When their hands stop their backward motion and begin to move towards the basket, somewhere in there will be your perfect release. Once you get the hang of finding a players perfect release, here are three drills that I use to improve my free throws in NBA 2K12. I recommend doing them at least once a week. DRILL #1 - Shoot 50 shots with each player and record your percentage. I like to go in and shoot with every player on my roster. I think 50 is a good number. With 12 players on your roster this means you will shoot about 600 free throws. This will take you about an hour. My goal with each player is two fold. The first is to hit as many out of 50 as I can. The second is to get as high a percentage of perfect releases as I can. I think it's also a good idea to record these practice sessions so you can see if you are improving or not. Here's a spreadsheet that shows my practice sessions so you can see how I record my results. The next drill I do sometimes is to shoot with each player on my team until I hit 10 in a row. This is extra tough with some players but it really makes you take the time to find each player's perfect release. With some players, you will nail the 10 right away but with others it's going to be a challenge. I shoot all10 free throws even if I don't hit all ten. I then go to the menu and reset the counter. Then I start another ten. Even if I miss one of the first few, I still shoot all ten. Then I reset. I repeat this until I get 10 in a row with each player. Another thing I like to do is see how many free throws I can make in a row with each player. I shoot until I hit and then shoot until I miss. If I miss the first shot, I will reset the counter. Then shoot again. If I hit that shot I will keep shooting until I miss a shot. If you do these things, you will quickly find that you can shoot a very high percentage from the line. I shoot over 80 percent from the line as a team with my Pacers after just two sessions. Here's a video of one of my practice sessions.